The learner proceeds through variety learning of experiences. The rate of improvement should be evaluated then and there; the learners have to be made aware of the findings; necessary help should also be provided to them at the appropriate time. The learner has to utilize the teacher's help to solve the problems arising during learning. Thus we provide the opportunity for the continuous evaluation of both the learner and the teacher which helps improvement. Different tools are used to evaluate the multi dimensional competencies of the learners. The following tools have been selected considering the practicability and the nature specific to different subjects. 1. At what stage each item has to be evaluated ? Let's examine project as an evaluation tool, for an example. A project is very important as a learning activity. Projects are investigative problems which arise while the learner passes through various learning experiences. The investigator can proceed to the next stage only after the completion of the previous stage. There have to be discussion, formulation of ideas, interim evaluation, help and guidance for the successful completion of the project. For example the teacher should not dictate the problem for learning, instead she should create an atmosphere/background in which a problem for learning in the class room takes shape on its own. The subject for the project should be chosen in such a way that it should provide enough possibilities for collecting information with an investigative frame of mind and complete it with a scientific procedure. Continuous evaluation should be carried out on each stage of the project. Indicators for evaluation are developed to help this. Indicators for each subject are given in their respective source books. Considering the common features of those indicators necessary changes have been made to suit the convenience of the teachers. Ability to determine in advance the duration of study, details of activities to be done at each stage. The ability for planning has to be assessed at the time of planning itself. Details of planning should be recorded in the project diary by the learner. Credibility/reliability of the data can be verified from the on the spot recordings in the project diary. The pupils should get a clear idea about the sources for data collection. For example, the pupil should get help to find out the sources for reference for a particular project. The teacher should conduct discussions with the pupils to find out possibilities and selection should be made considering the practicability. After assessing this stage, the teacher should provide facilities for those pupils who do not have access to the necessary sources. Ability to formulate suitable suggestions/proposals on the basis of the findings. There may be projects where data-collection is done as group activity or individual activity. But, the process of analysis and arriving at conclusions individually, may be encouraged. Evaluation of the learner should be done at each and every stage of the project. Ensure necessary help to perform the next stage. Immediately after the completion of the projects, they should be collected and evaluated. After evaluation, the reports may be returned to the learners. Evaluation can be done during presentation of reports (for those who get opportunity for presentation.) For others, short interviews will do. 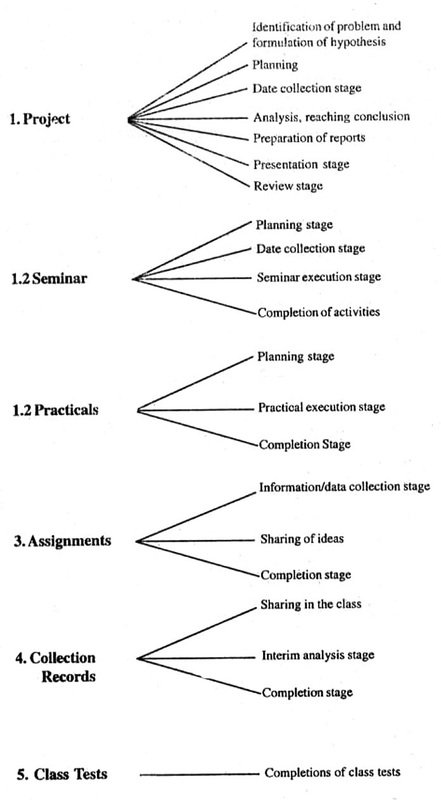 The teacher should plan to asses each stage of the project. (See Appendix-I for model plan and diary.) At every one these stages it has to be evaluated as to how far the learner utilizes her ability to think things over. The cover page should have the title of the project, period of the study, name of the members of the group (if it is done by group), address of the school etc. The project diary should be helpful to prepare project report. The learner should note down the objectives/hypothesis, methodology, duration of study etc. The authenticity of the report and the genuineness of the data are verified using the project diary. Hence, the teacher may give instructions to prepare the project diary thereafter. The teacher may conduct interim evaluation to see whether the learner makes entries in the diary at the appropriate time. No changes need be made in the diary and report in the case of projects already completed. Assignments are learning activities undertaken as a continuation of classroom activities to realise the curriculum objectives. They should be completed in a time bound manner. They help to lead the learner to higher level of learning from the present one. There will be Assignments for constructing models, writing, drawing on the projects given. For the assignments on constructive activities, there should be short notes on the procedure of production. Here also, we evaluate the ability of learner to make use of her thinking ability in the learning activity. Use indicators given in the sourcebooks of subjects concerned. Class tests are meant for identifying and solving learning problems. Use this as a tool for getting feed back from pupils during learning process. It need not be a written tests alone. Performance tests is also advisable. Attention maybe given not to include more than one unit in class test. Ensure the attendance of all the pupils at class tests. Class tests are conducted by the teachers of the subject concerned. Question papers are to be set up in schools following guidelines of the school examination board. Class-tests should be informal. No need for blue print, time table and printed question papers. Questions should be in tune with the spirit of the approach. Time should be limited to one period. Total score for a class-test should be 10 (earlier it was 20: for convenience it may still be used.). Share the findings of class tests with the pupils and do follow-up activities. Certain amendments have been made for the timely completion of the continuous evaluation programme during 2004 - 2005 school year. Instead of 5 areas in each paper it is changed as 5 areas in each subjects. The records/products of class tests should be scored by the teacher with instructions and signed. After verification by the parents they should be filed properly. Class tests, term evaluation and annual examination should be in tune with the new approach. No questions to be prepared to test the rote memory. Questions should be based on the learning process and the new approach to each subject. Results should be scientifically analysable. Evaluate tools and their continuous evaluation stages - at a glance.